The federal health information technology (IT) market is poised to remain strong and grow slightly over the next five years, which makes it one of few exceptions to the trend of declining federal spending. Government agencies are pursuing healthcare goals and technology modernization as ongoing budget pressure introduces new contracting approaches and technology requirements. 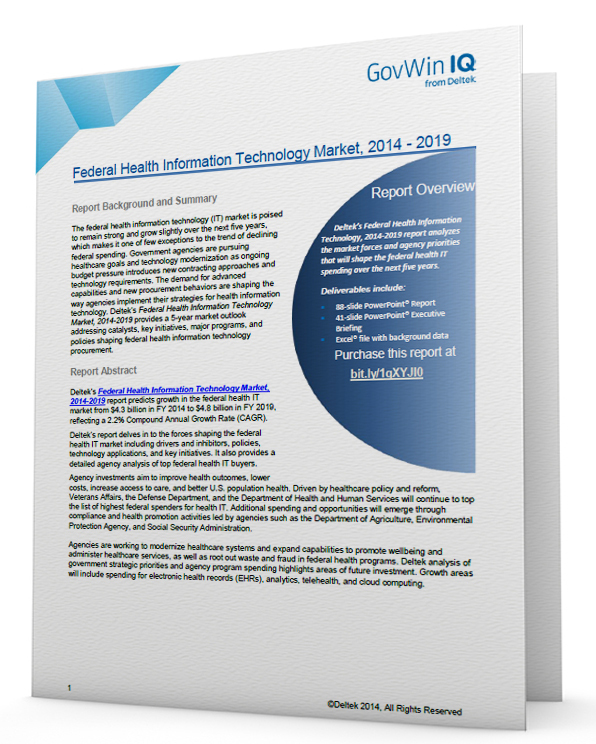 Deltek’s Federal Health Information Technology Market, 2014-2019 report predicts growth in the federal health IT market from $4.3 billion in FY 2014 to $4.8 billion in FY 2019, reflecting a 2.2% Compound Annual Growth Rate (CAGR). Download the free summary and gain insight in the forces shaping the federal health IT market. A detailed agency analysis of top federal health IT buyers.